Once seated, we noticed a card on the table with the title "Blind Tasting". I initially thought this was about a wine pairing, but it turns out that the restaurant was asking diners whether they would forgo ordering from a menu and just let the chef choose 6 courses to serve them. Well, this is giving carte blanche to the chef, or omakase (お任せ) as the Japanese would call it. This certainly isn't anything new to me, and I'm happy to trust chefs to do the best they can. So we went for it. 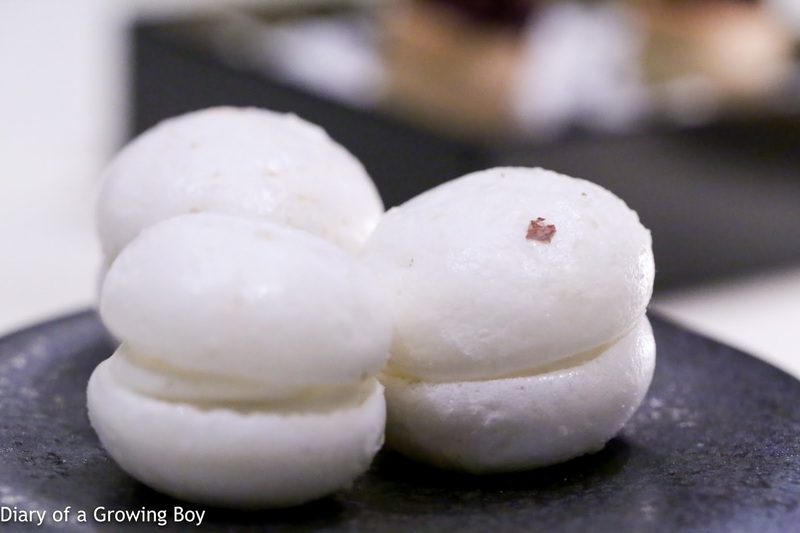 Hazelnut macaron with smoked eel - the "macarons" were made of very soft and foamy meringue, with a layer of smoked eel mousse in the middle. Pig's blood tart with mushroom and apple - this was a nice surprise, as I wasn't expecting many fine dining establishments to be serving pig's blood. Of course, the three Taiwanese at the table had absolutely no issues with it, and I found it pretty delicious - especially with the slice of crunchy and slightly acidic apple in the middle. Charcoal bread - pretty interesting, with fennel seeds and what seemed to be apricot bits inside. 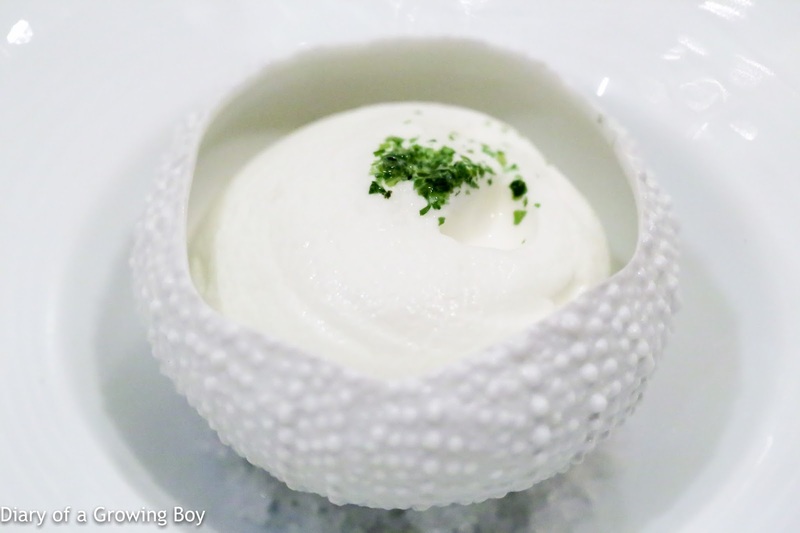 Our amuse bouche was sea urchin topped with Granny Smith apple gelée and Granny Smith foam. There were also bits of crunchy, raw onions inside. Pretty nice. Salmon in two ways, Uruguayan Oscietra caviar - this was very good. 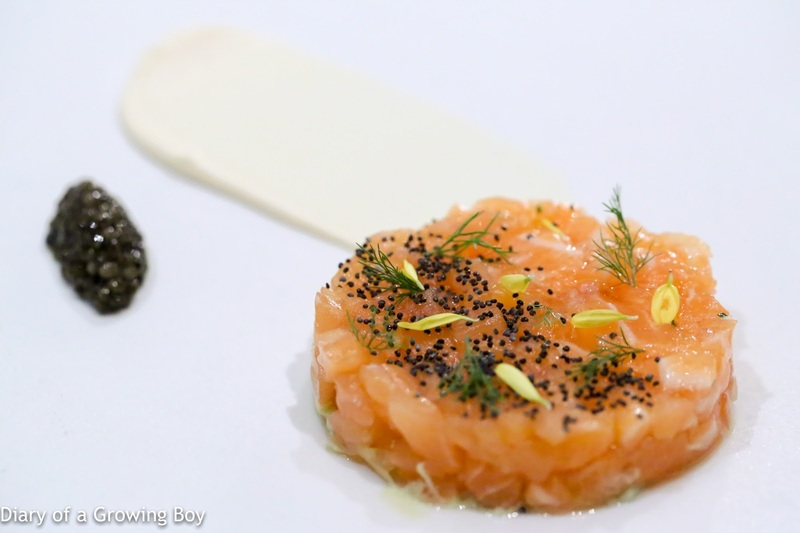 There was a mix of raw and smoked salmon, which provided a subtle difference in textures in addition to the smoky flavors. This was mixed with what seemed to be iceberg lettuce (? ), raw onions, and very finely diced ginger, then sprinkled with some poppy seeds on top. All of these ingredients added a bit of crunch in addition to lending their flavors. The dill on top added a familiar touch. 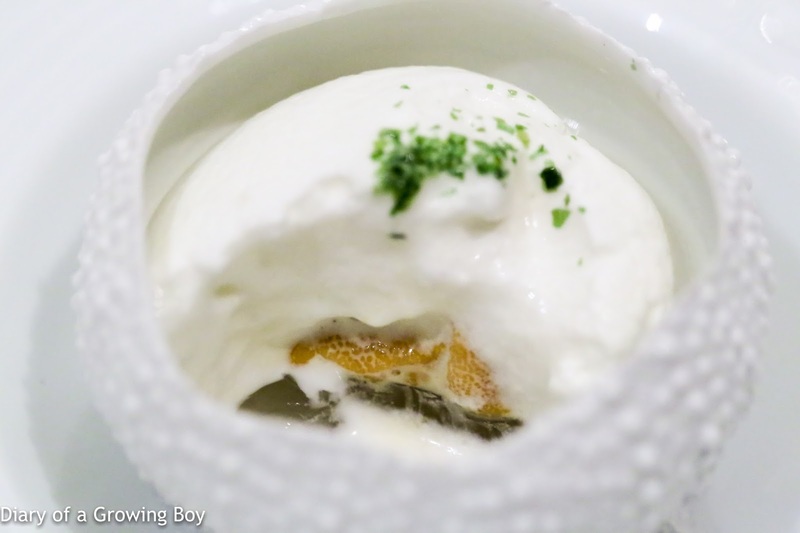 The caviar on the side provided a stark contrast with their saltiness, and while the lemon cream added the expected sweetness, it also brought a very strong and bitter finish that I didn't care for. 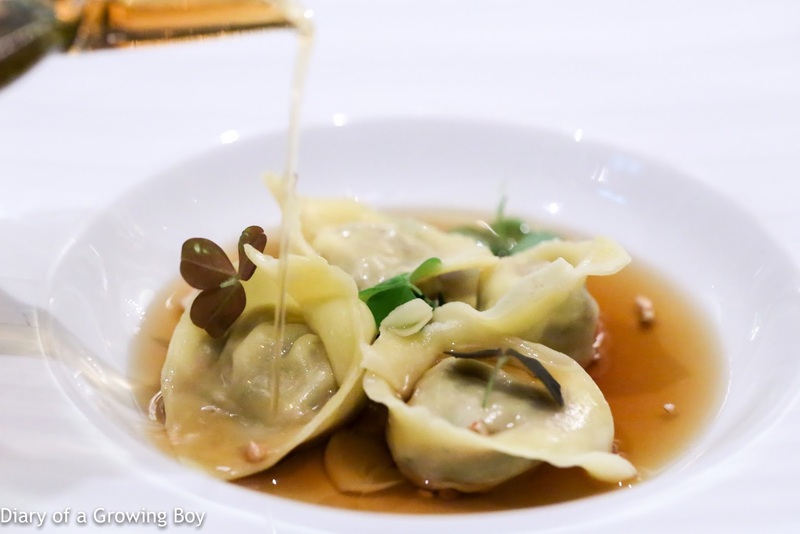 Duck leg ravioli, duck confit with duck consommé - we were told that these were foie gras tortellini, but the filling was definitely mostly shredded duck leg. This was very tasty, and the duck consommé provided spoonfuls of big flavors - seasoned with thyme. The wood sorrel brought a touch of acidity to balance out the big, savory flavors, the lily bulbs added some starchy sweetness along with their crunch, while the toasted buckwheat added a bit of toasty fragrance. A simple and straightforward dish that delivered a lot of satisfaction. Thinly sliced calamari à la plancha, cabbage and Amalfi confit lemon sauce - the calamari have been sliced into thin noodles before being cooked à la plancha, and this gave us lovely smoky flavors as well as wonderful, tender texture. 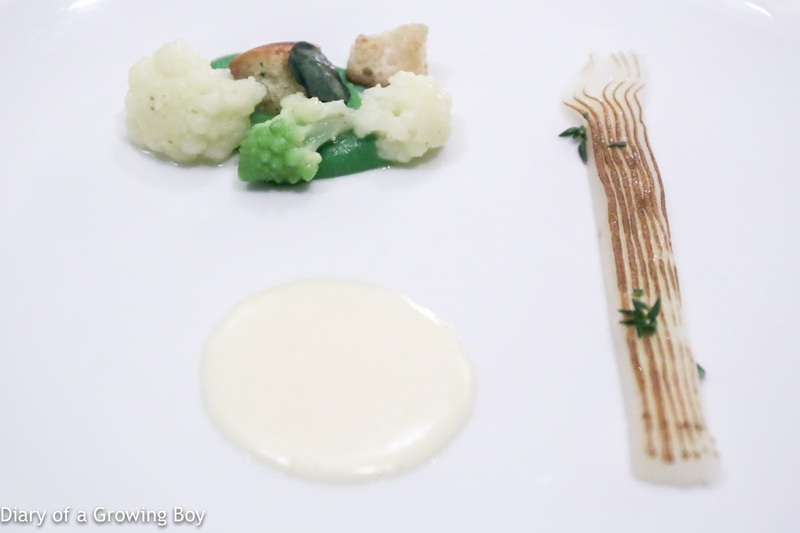 Served with some lemon cream sauce as well as cabbage, cauliflower, romanesco, and smoked broccoli purée. 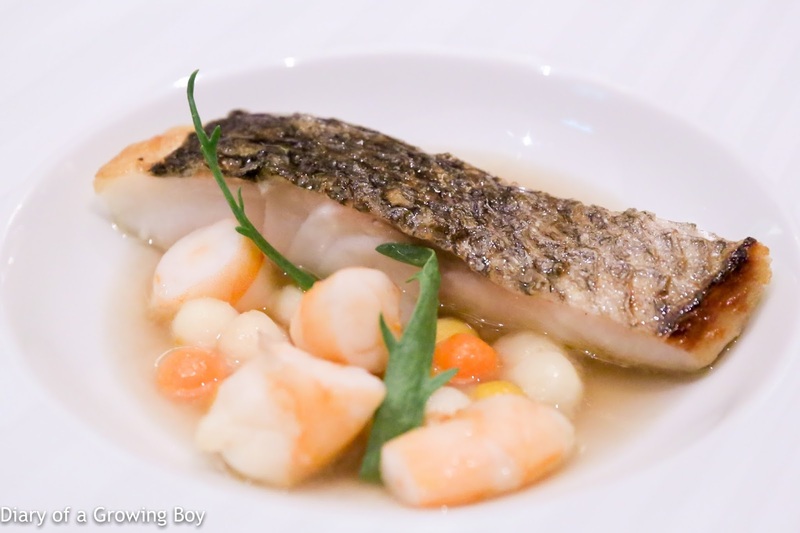 Line caught sea bass with confit blue shrimps, heirloom vegetables from Annie Bertin's garden - the sea bass was very, very tender, with nice, smoky flavors from the lightly charred skin. The Obsiblue prawns were nice, and the legumes from Annie Bertin in France seemed particularly fresh given their outstanding crunch. The prawn stock that was poured into the bowl? Wow. I wish I had a supply of that stock handy in my kitchen. 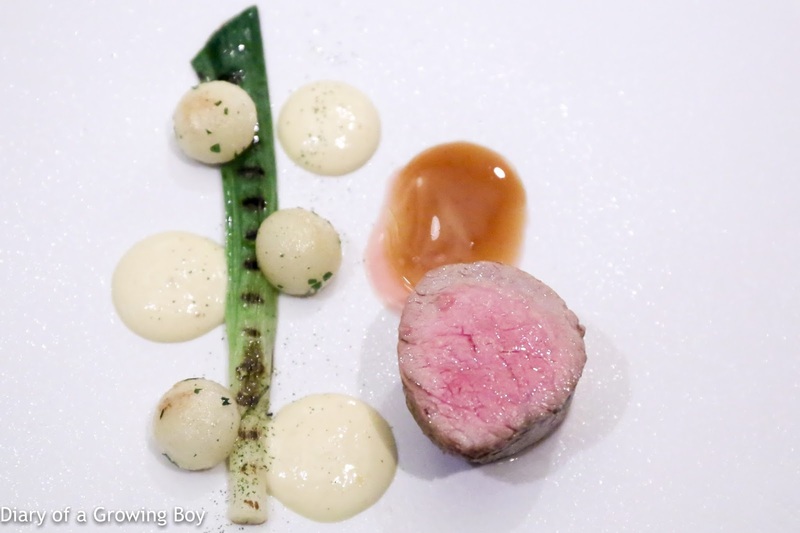 Grilled veal filet from Olivier Metzger, leeks and béarnaise sauce - a very pretty presentation, with the Ratte potatoes and béarnaise positioned alongside the single leek, and a sprinkle of what I guessed was leek powder. The veal was cooked medium-rare and looked nice and pink in the middle, and was indeed pretty tender inside. However, while the exterior seemed soft, it was actually a little on the dry side, and the muscle fibers were very noticeable. A little disappointing. The veal jus was nice, though. Valencia mandarin pie, saffron ice cream and merengue - I was advised against ordering dessert even before I arrived at the restaurant, as I was told that they don't have a pastry chef. This pile of meringue was deathly sweet, and the Valencia mandarin filling in the middle had no hope of being able to overcome the amount of sugar in that mouthful. The ice cream - made with saffron sourced from Sospel, France - was more interesting. 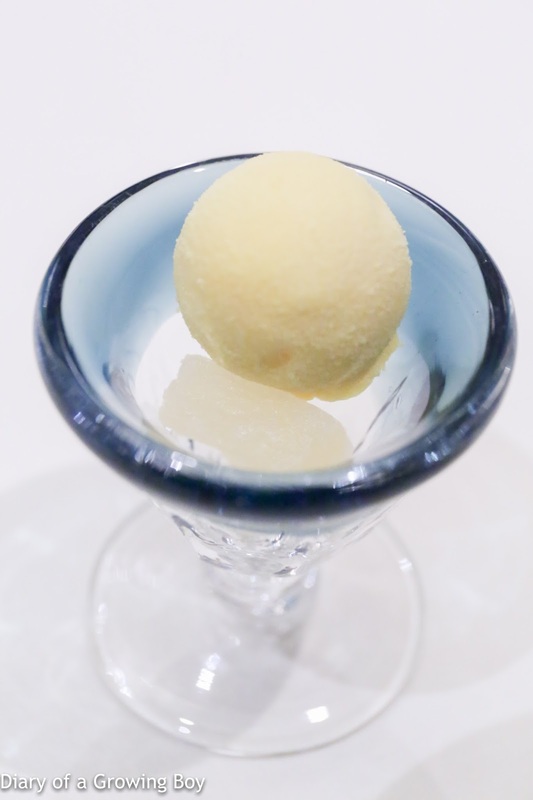 Inside the cup was a piece of candied pineapple as well as a white chocolate truffle with pineapple filling. 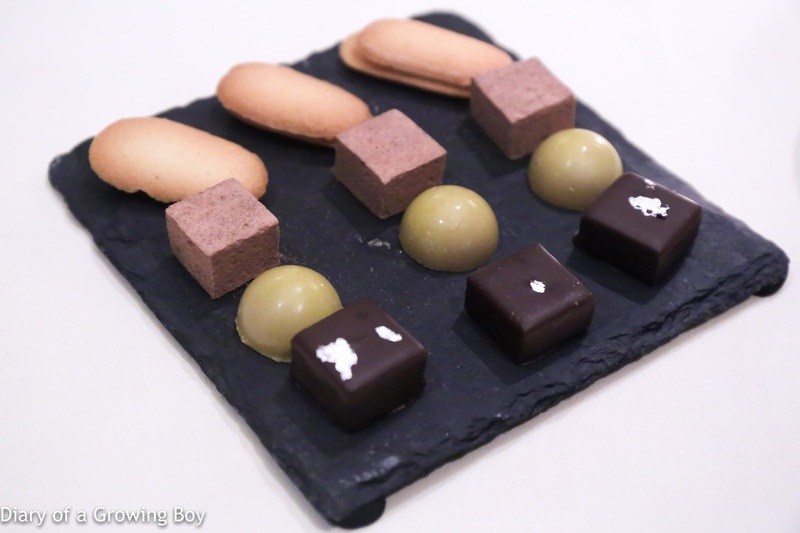 Mignardises - we weren't told what these were, but I think they were dark chocolate truffle, salted caramel bonbons with passion fruit, marshmallow with nutmeg/cinnamon, and langue de chat with minty pastry cream. Per restaurant policy we were able to bring two bottles of our own wines, and we happily paid corkage for this. 1990 Trimbach Clos Ste. 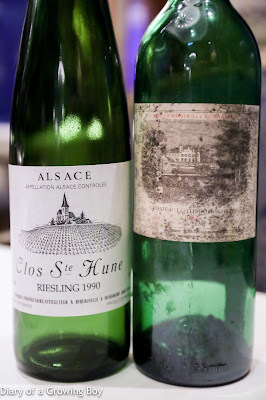 Hune - a beautiful wine! Very open and fragrant, with flint, petrol, nice fruit, white flowers, and some lemon in the nose. Some residual sugar here but really good acidity, especially after opening up. 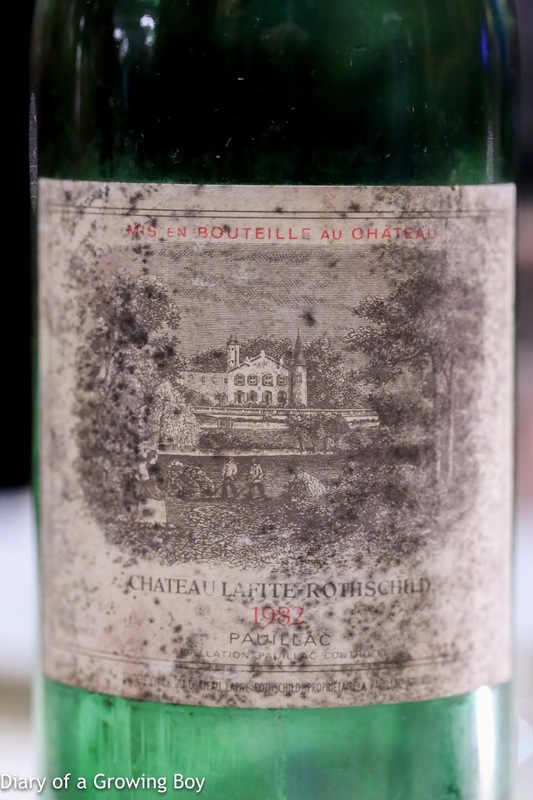 1982 Lafite-Rothschild - decanted for more than a hour prior to serving. Drinking very well, with smoky nose along with tobacco and pencil lead. Still some fruit here. Silky smooth. Started going downhill after almost 2 hours in the decanter. We also discussed how Petrus' place on the Hong Kong dining scene had undergone a complete change over the years. When I first arrived in Hong Kong more than 20 years ago and wanted a place to celebrate my first birthday in the city, Petrus was the restaurant I chose. These days I don't hear any of my friends talk about going to Petrus, and the departure of Chef Frédéric Chabbert a few years ago aroused people's interest mainly because of where he landed... In fact most of my friends couldn't even be bothered to find out who replaced Frédéric - myself included. Undoubtedly the restaurant's dated decor scores negative points with some of the younger diners today, but unfortunately this isn't something that is easily addressed. But with our dinner tonight, I have renewed hope for the restaurant. The dishes tonight may not be ones that feature on #theartofplating, but they all come with carefully sourced ingredients - the arrangement of which are all well-thought-out. And here's a chef who challenges the diners to trust him by offering his "blind tasting". 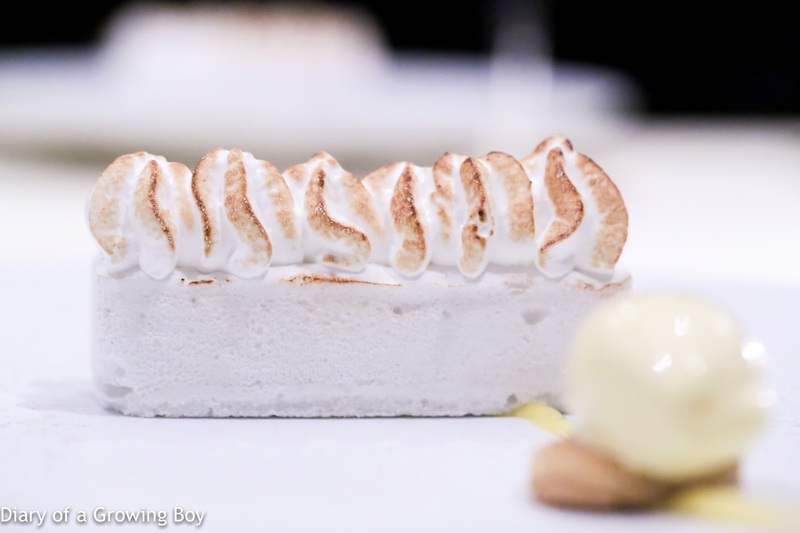 In the past I've only done that with chefs I know well - or in a place like Quintessence with their carte blanche menu. Hopefully more diners in Hong Kong will accept the omakase-style menu and discover a different kind of cuisine from Ricardo. Next time, though, Imma ask Ricardo to cook me some of his Venezuelan repertoire.